Saskatoon, Sask. – August 3, 2016 – UFCW Canada Local 1400's community garden has recently received praise from community members and beyond. The garden was planted as part of the Honouring Memories, Planting Dreams initiative, which acknowledges and honours residential school survivors and their families. 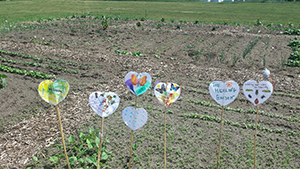 Each heart represents the memory of an Aboriginal child lost to the Residential School system, and the act of planting represents that individual's commitment to finding their place in reconciliation. Following a Directions article on the Local 1400 reconciliation initiative, the local received a letter from Colleen Hamilton, the Aboriginal Engagement Coordinator at the CHEP Good Food community agency in Saskatoon. "I was delighted to receive pictures of your community garden and the story of the hearts that you put in gardens across the country,” writes Sister Hamilton.“The quote in the story saying that, ‘the hearts were decorated by members, children and grandchildren of members, all while learning the history of reconciliation,' really made my heart feel good as the youth would be the ones that will make changes in our future and also learn to grow food. As a Métis woman I thank you, and as a fellow Canadians, we all must learn more about the past, to make a better future and what you did this year for reconciliation in your garden made mother earth smile across Canada as you have open many hearts to grow. Thank you." Throughout the 1870s to 1996, approximately 150,000 Aboriginal children were taken from their families by the federal government and placed in Residential Schools. The intergenerational trauma and the impact of Residential School abuse faced by Aboriginal children continue to have ripple effects on indigenous communities to this day. You can find out more about UFCW Canada's Reconciliation initiatives here.